Our 6-1/2 year old son has a love for anything on wheels and has a fascination for magnetic toys. He also is quite adept at building with construction sets and models. 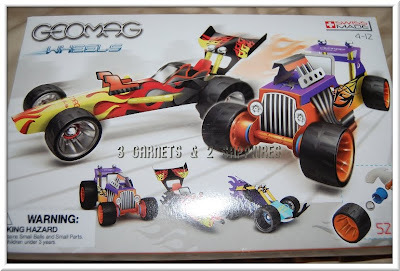 That is why when I discovered Geomag Wheels by Reeves Toys, a brand of Swiss made race car-themed magnetic toys for kids, I knew this product line would be something our son would be excited about. 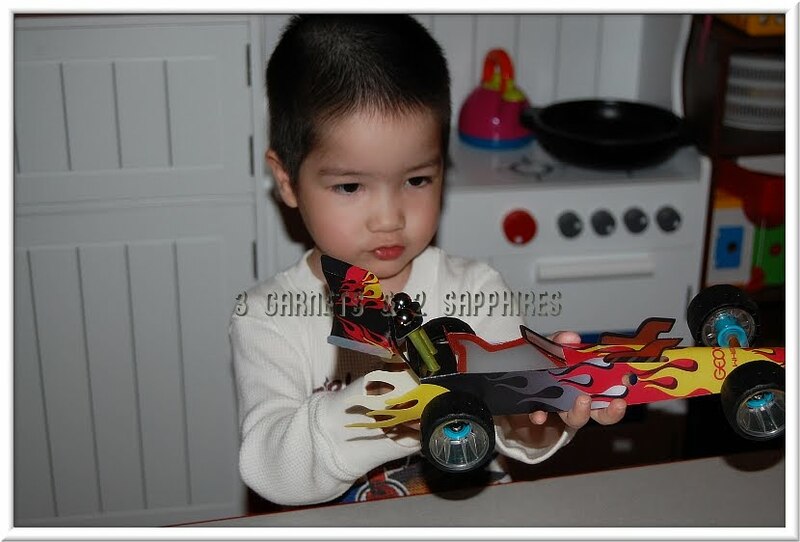 We received the 52pc Wheels Fantasy Race Set to try out. Since the manufacturer's age recommendation is for ages 4 to 12, I did not really know what to expect. 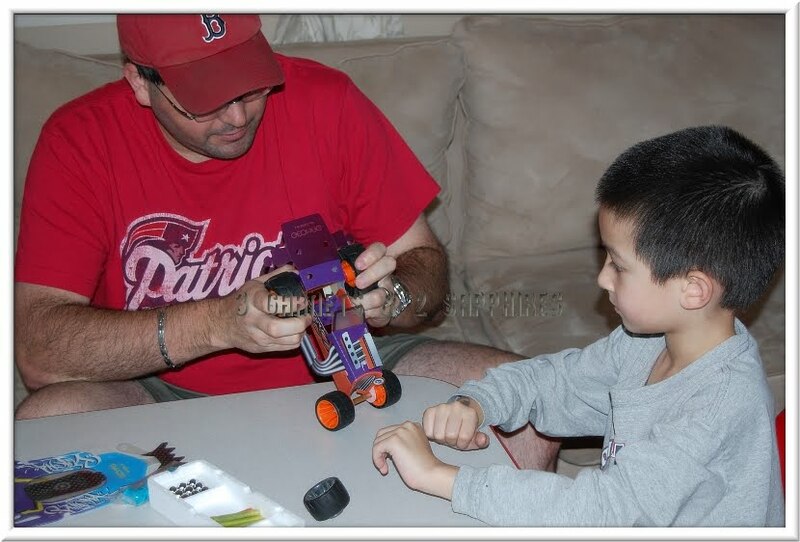 Although I try to stick with age-appropriate toys for my children, I have found that our son finds toys that are targeted at children a year or two older than he is to be more engaging. After trying out this toy, I think that the age recommendation is a little off. I would personally suggest this toy for children ages 8 to 12. This set did not include any instructions, so due to its complexity, it was highly unlikely that our 6 year old son would be able to build one of these cars unassisted without feeling very frustrated. My husband ended up building the whole thing based on the images on the back of the box. Above is an example of a finished race car. 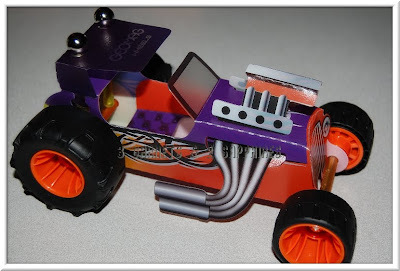 Below is an example of a mostly finished car held by our nearly 4 year old son. Our boys were disappointed that they could not have two completely built cars to play with together. In addition to the complexity of the building of these race cars, another reason why I think this toy is better suited for slightly older children is because these cars cannot be crashed, dropped, and played with like younger children would want. Although the magnetic rods and steel spheres have quite a strong connection, I worry that the two spheres that sit on top of each car (not the ones inside the tires) will get bumped and fall off. Even though our oldest was not able to build these vehicles by himself, he and his little brother still appreciated the coolness factor of these race cars. They are very awesome to look at and watching them being transformed from a flat piece of Flexiform into a 3-dimensional toy was equally as awesome. 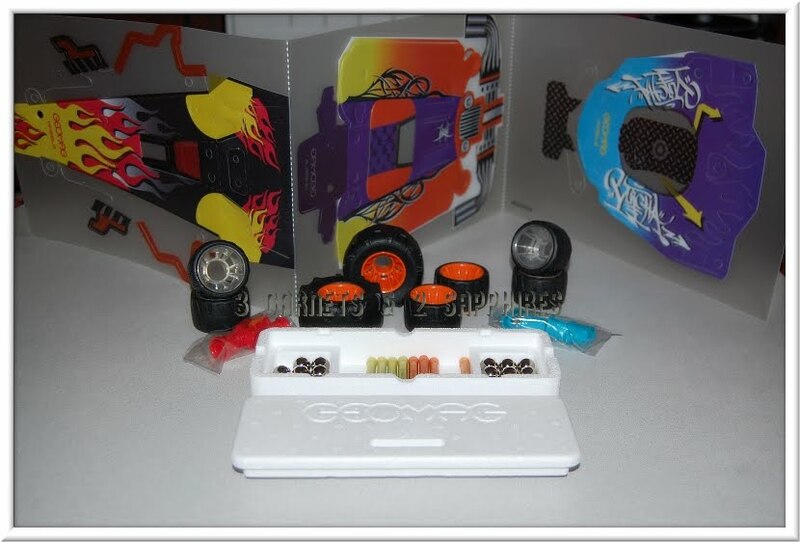 This particular Geomag Wheels set retails for $25. To see more unique toys for kids from the Geomag Baby and Geomag Kids lines, visit ReevesIntl.com . Thank you to Reeves International for sending us a complimentary product sample to base this review upon and for providing a second product for our contest prize. One lucky reader will receive one product from Reeves International (up to a $30 value). Browse the selection of Reeves International toys. Then leave a comment telling me the name of the one toy that is your favorite. You MUST do this to be eligible to win this contest. 3) For 10 extra entries, sign up to receive email updates from Reeves International. Then come back here and leave TEN separate comments telling me you did. 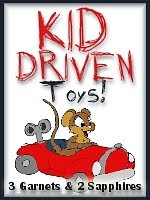 5) For 1 extra entry, "Like" Reeves International Toys on Facebook. Then leave a separate comment with the link to your Facebook profile.